10.4" x 15.4" stitched on 14 count. 8.1" x 12.0" stitched on 18 count. 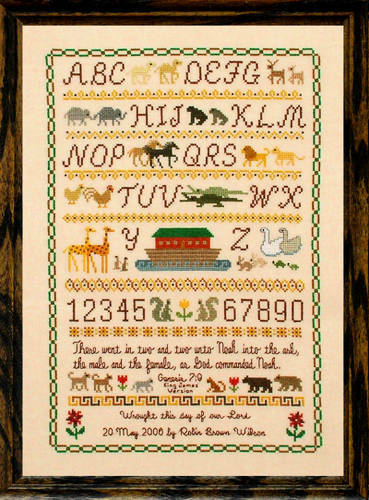 Noah's Ark Sampler cross stitch pattern... This sampler design is of assorted animals with Noahs Ark. All whole stitches. Design rows are between rows of letters and animals. Backstitches and bead eyes highlight the animals. The border is in basic nature colors.